We’d love your help. Let us know what’s wrong with this preview of Lives Laid Away by Stephen Mack Jones. Detroit ex-cop August Snow takes up vigilante justice when his beloved neighborhood of Mexicantown is caught in the crosshairs of a human traffickingscheme. When the body of an anonymous young Hispanic woman dressed as Queen Marie Antoinette is dredged from the Detroit River, the Detroit Police Department wants the case closed out fast. Wayne County Coroner Dr. Bobby Falco Detroit ex-cop August Snow takes up vigilante justice when his beloved neighborhood of Mexicantown is caught in the crosshairs of a human traffickingscheme. When the body of an anonymous young Hispanic woman dressed as Queen Marie Antoinette is dredged from the Detroit River, the Detroit Police Department wants the case closed out fast. Wayne County Coroner Dr. Bobby Falconi gives the woman's photo to his old pal August Snow, insisting August show it around his native Mexicantown to see if anyone recognizes her. August's good friend Elena, a prominent advocate for undocumented immigrants, recognizes the woman immediately as a local teenager, Isadora del Torres. To ask other readers questions about Lives Laid Away, please sign up. This series is just plain fun. Easy to read because Jones has a gift for dialogue and pacing. The mouth watering food descriptions don't hurt either. You could gain 5 lbs just reading this book. If I could give more than 5 stars, I would. 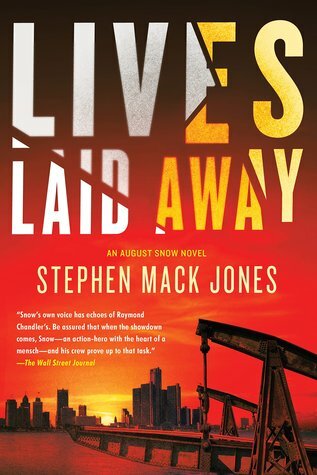 When this book is published in January 2019, everyone who loves a great read should get this #2 in Stephen Mack Jones' August Snow series. Received an advance copy of the book from Soho Press. As impressed as I was with Jones' debut, August Snow, the second outing is, I think, even better. I picked up the book earlier today and read at least 2/3rds of the book before bed. The storyline includes some truly disturbing elements, but doesn't wallow in them If I could give more than 5 stars, I would. When this book is published in January 2019, everyone who loves a great read should get this #2 in Stephen Mack Jones' August Snow series. Received an advance copy of the book from Soho Press. As impressed as I was with Jones' debut, August Snow, the second outing is, I think, even better. I picked up the book earlier today and read at least 2/3rds of the book before bed. The storyline includes some truly disturbing elements, but doesn't wallow in them. Balances the sometimes ugliness with some very funny exchanges as well. August Snow is a terrific character and Detroit has a star turn too. Some characters introduced in August Snow thankfully return for this second episode (Jimmy, Tomás, Elena, O'Donnell...) and some that I hoped would be continuing characters (Oligivy and Lucy) contribute much to the action and then leave (sniff). I love how Jones includes such incredible detail in his writing. He always mentions the beer the characters are drinking, their style or brand of clothing, and other such things. The attention to detail is incredible. I felt like I was watching an action-packed thriller whilst reading this novel. I can't wait to meet the author at Booktopia. "Her secret ingredient was nutmeg." August Octavio Snow is making salsa in his kitchen on Markham Street in Mexicantown in Detroit. Jimmy Radmon, Carlos Rodriguez, Sylvia and Carmela. Tomás and Elena Gutieriez. Bobby Falconi. While Snow rhumba ruminates, we find out what/who is new in the neighborhood since we left. The shady shiny SUV crawling the street in dark-heart hours. Apollonius "Brutus" Jeffries. Trent T. R. Ogilvy, man-bun Brit yoga instructor at Club Brutus. Detective Captain Leo Cowlin "Her secret ingredient was nutmeg." August Octavio Snow is making salsa in his kitchen on Markham Street in Mexicantown in Detroit. Jimmy Radmon, Carlos Rodriguez, Sylvia and Carmela. Tomás and Elena Gutieriez. Bobby Falconi. While Snow rhumba ruminates, we find out what/who is new in the neighborhood since we left. Apollonius "Brutus" Jeffries. Trent T. R. Ogilvy, man-bun Brit yoga instructor at Club Brutus. Detective Captain Leo Cowling. Lady B. Megan O'Donnell. "Marie Antoinette took a header off the Ambassador Bridge this past Sunday." The plot is so timely sharp you can cut yourself. The bandage is Valkyrian riposte. Dense, rich, thick. The subject is terrifying, the players broad spectrum human And we get needed respite from the eye popping action with designer shoes, delicious food, collectible handguns, southeast MI, classic motorcycles; and everyday hero neighbors. When the body of an anonymous young Hispanic woman dressed as Queen Marie Antoinette is dredged from the Detroit River, the Detroit Police Department wants the case closed out fast. Wayne County Coroner Dr. Bobby Falconi gives the woman's photo to his old pal August Snow, insisting August show it around his native Mexicantown to see if anyone recognizes her. August's goo I received a DIGITAL Advance Reader Copy of this book from #NetGalley in exchange for an honest review. When the body of an anonymous young Hispanic woman dressed as Queen Marie Antoinette is dredged from the Detroit River, the Detroit Police Department wants the case closed out fast. Wayne County Coroner Dr. Bobby Falconi gives the woman's photo to his old pal August Snow, insisting August show it around his native Mexicantown to see if anyone recognizes her. August's good friend Elena, a prominent advocate for undocumented immigrants, recognizes the woman immediately. Her story is one the authorities don't want getting around--and she's not the only young woman to have disappeared during an Immigration and Customs Enforcement (ICE) raid, only to turn up dead a few weeks later. Preyed upon by the law itself, the people of Mexicantown have no one to turn to. August Snow, ex-police detective, will not sit by and watch his neighbors suffer in silence. In a guns-blazing wild ride across Detroit, from its neo-Nazi biker hole-ups to its hip-hop recording studios, its swanky social clubs to its seedy nightclubs, August puts his own life on the line to protect the community he loves. I don’t live in Detroit (I live in Canada) but I spend a lot of time there for book-related events so I really enjoyed this novel for this reason as I recognized the area (unlike books set in Paris or London where I can only imagine where things are in my brain). I LOVED THIS |BOOK. Having loved “August Snow” I was glad to see that the author decided to write a series of books. The book is a thrill ride … it zips all over the place and when you are done, you are exhausted but happy you read it. A great thriller if you are looking for one … I am just going to adore recommending this book and am waiting for book #3! I am in love with this series. The second book in the August Snow series was even faster paced than the first. Non stop action with humor, grit and even touching moments. This would make an incredible limited series for cable! Cannot wait to see what comes next for August Snow! I'm not sure I liked this one as much as the previous one, but I liked it a lot. This book made me very hungry. Not usually a mystery reader but this was hard to put down. I really enjoyed Stephen Mack Jones' August Snow and looked forward to a new book. Snow won a wrongful dismissal suit against the Detroit Police Department and the City of Detroit, and he's used the $12 million settlement to renovate the houses of Mexicantown one at a time. He's bringing his neighborhood back to life, and I really like that. From Snow's voice to the book's secondary cast, from the information about Detroit to its tone of pragmatic hopefulness, the first book really had me lookin I really enjoyed Stephen Mack Jones' August Snow and looked forward to a new book. Snow won a wrongful dismissal suit against the Detroit Police Department and the City of Detroit, and he's used the $12 million settlement to renovate the houses of Mexicantown one at a time. He's bringing his neighborhood back to life, and I really like that. From Snow's voice to the book's secondary cast, from the information about Detroit to its tone of pragmatic hopefulness, the first book really had me looking forward to the next one. Unfortunately, I wasn't particularly happy with what I found. If your outlook on immigration-- both legal and illegal-- tends toward the conservative, you're not going to like this book. I had no problem with the book's more liberal viewpoints and having some of the people in the Immigration and Customs Enforcement agency be bad guys didn't bother me either. In the opening pages, Lives Laid Away was set up as Snow seeking justice for two murdered girls most law enforcement would consider throwaways. The Harry Bosch in me was rubbing my hands together in anticipation, but what followed was a disappointment. The entire book devolved into Rambo (Snow) and sidekick loading up with weapons and heading to one shootout after another. I've never been a fan of Sylvester Stallone or the My-Gun-Blows-Bigger-Holes-in-People-than-Yours-Does school of film and fiction, so reading rapidly became a chore. So... a bit of a sophomore slump that makes me wonder if I want to read a third book in the series. When August Snow was released I was one of its biggest fans. That book was a 5 star+ novel so I was anxious for the next one. Lives Laid Away is a good read but feel it falls way short of the debut novel. The liberal views expressed didn’t bother me, nor did the violence but I have to question why so much violence was necessary for the story line. I question why it was so necessary that the death count along with so much violence and death had to be part of the story line to get points across? A When August Snow was released I was one of its biggest fans. That book was a 5 star+ novel so I was anxious for the next one. Lives Laid Away is a good read but feel it falls way short of the debut novel. The liberal views expressed didn’t bother me, nor did the violence but I have to question why so much violence was necessary for the story line. I question why it was so necessary that the death count along with so much violence and death had to be part of the story line to get points across? As another reviewer said…..this novel quickly became a Rambo type read with far too many unbelievable shootouts. After reading August Snow, I know Jones is capable of a far better novel. Hopefully that will happen with the next in this series. My thoughts: When I first began Lives Laid Away, it dazzled me. This is definitely a 5 star book! I thought. But as I continued reading, a vague disappointment settled over me. No spoilers. While it brought the story around full circle, the ending lacked the pizzazz of the beginning. The snappy voice was the same; the characters were now familiar; questions were answered. But were those the questions I had? Were they the ones I wanted answered? Did I need those last t My thoughts: When I first began Lives Laid Away, it dazzled me. This is definitely a 5 star book! I thought. But as I continued reading, a vague disappointment settled over me. No spoilers. While it brought the story around full circle, the ending lacked the pizzazz of the beginning. The snappy voice was the same; the characters were now familiar; questions were answered. But were those the questions I had? Were they the ones I wanted answered? Did I need those last two chapters? Not really. Yes, they were well-written. They were interesting. They kept my attention. People who read August Snow might be more interested in the answers about one character's background. It felt irrelevant to me. If this scene had been earlier in the story or this backstory issue mentioned more frequently throughout the book, I might understand its inclusion better. The other chapter was too long in relation to the importance of the information we learn. Must say, though, it does help me understand Snow's relationship with his late father better. Still, couldn't it have been included earlier? Ultimately, I didn't want or need this wrap-up of the story. The story could've ended on page 273 and I would've been content. Body counts: number of characters killed in the novel. There's a lot. (I lost count.) This bothers me. Other than the first victim, we don't learn anything about any of these now-dead characters. Lots are nameless bad guys, no background, nothing. Snow seems almost comfortable shooting people or threatening to shoot people. It's disconcerting how many times he draws a gun during the novel. While I know he's capable of compassion and he believes he is acting in the defense of others, it still troubles me. He's a complex character. An FBI agent describes him as a "a very observant, very dangerous grenade" (pg. 65) and I agree. Jones is a prize-winning poet, and his use of language reflects this. His careful, judicious word choices bring Detroit to life for me. He can describe more in five words than I can in one hundred. (I'm not a poet!) I've never been to Detroit, much less to Mexicantown, but Jones's setting is practically a character in its own right. No joke, I think there's enough food described here for a recipe book. (Or at least the start of a food blog!) Between Lady B's strawberry cream-filled donuts, Snow's mama's salsa, his grandma's broccoli-bacon-sunflower-seed salad with dried cherries and poppy seed dressing, Lucy's (failed) attempt at chili (and more successful retry), and endless rounds of bourbon, I may've gained a few pounds while reading the novel. Snow's snappy, irreverent voice flows through the book. He and his godfather/sidekick Tomas banter. In my notes, I wrote, love Tomas! Every major character has ready quips, quick comebacks, and funny one-liners that make them likable (or at least memorable). While there are a lot of authors who use banter in serious novels, this one is notable for being consistently funny while deftly handling the heavy subjects of immigration and human trafficking. Jones manages the two such that the irreverent tone underscores the serious nature of trafficking crimes, rather than making light of it. I'm not entirely certain how he did it, either. I enjoyed how Jones portrayed long-married, loving couples. Tomas and Elena's relationship feels real. August Snow watches his godparents argue, thinking of his late parents' arguing, and takes comfort in it, "(k)nowing they were at loggerheads in an effort to better understand, respect, love and protect each other" (pg. 40). In my opinion, we could use more portrayals of loving long-married couples in fiction. The relationships in this book are complex and reflect real life. Because Jones does a terrific job creating vivid characters, it's easy to keep the relationships straight. There are twists that truly surprised me. There were things that truly shocked me. It was eye-opening and unflinching in portraying the horror of human trafficking and the fear and hope of immigrants. As much as I enjoyed the first novel, set in Mexicantown of Detroit, but using the entire Metro area as a backdrop, this one veered between formulaic -- think of badass Jack Reacher who talks a lot more, embraces his mixed heritage, and also definitely DOES place value in material possessions, even if much of his largesse is to help other people -- and strangely falling flat in the authenticity department. The latter seems to matter a lot to Jones, who is clearly of the James Lee Burke school of As much as I enjoyed the first novel, set in Mexicantown of Detroit, but using the entire Metro area as a backdrop, this one veered between formulaic -- think of badass Jack Reacher who talks a lot more, embraces his mixed heritage, and also definitely DOES place value in material possessions, even if much of his largesse is to help other people -- and strangely falling flat in the authenticity department. The latter seems to matter a lot to Jones, who is clearly of the James Lee Burke school of making everything local sound as real and authentic as possible. Yet, some descriptions are odd, if not entirely wrong -- e.g., the description of Royal Oak... "is to Detroit what Austin is to Texas"? Hello? Wouldn't that actually be... Ann Arbor? And 12 Oaks Mall in... Farmington? Really? Show me where! (The Mall is actually in Novi). And nobody who wants to keep their sanity would take this companions there on a Saturday afternoon! Jones is both a good writer and a good story teller. August Snow and his friends and neighbors are still a great group of people to spend time with, the dialogue is always crisp and clever, and his portrait of the city of Detroit, its neighborhoods and its scenes in their latest incarnation is as real as it gets. There are a couple of new characters in the mix who deserve to come back and become regulars – Lucy Three Rivers, a tough Native American teenage hacking wizard and Trent T. R. Ogilvy, Jones is both a good writer and a good story teller. August Snow and his friends and neighbors are still a great group of people to spend time with, the dialogue is always crisp and clever, and his portrait of the city of Detroit, its neighborhoods and its scenes in their latest incarnation is as real as it gets. There are a couple of new characters in the mix who deserve to come back and become regulars – Lucy Three Rivers, a tough Native American teenage hacking wizard and Trent T. R. Ogilvy, a man bun sporting yoga instructor, general fixer, and ex SAS commando. The plight of the immigrant community and the activities of ICE are a large part of the plot line, reflecting the current political situation. Any one who reads the Detroit newspapers regularly will recognize the reality Snow portrays. Lives Laid Away is the second book featuring August Snow, a former cop in Detroit. I haven't read the first book but had no trouble following this one; Jones summarizes what we need to know. Snow gets involved in a case after undocumented women start getting murdered, and all signs lead to ICE and some local neo Nazis. Snow doesn't necessarily do a whole lot of detective work per se; more like he finds some info out and then goes somewhere and starts shooting people. There were a few threads in Lives Laid Away is the second book featuring August Snow, a former cop in Detroit. I haven't read the first book but had no trouble following this one; Jones summarizes what we need to know. Snow gets involved in a case after undocumented women start getting murdered, and all signs lead to ICE and some local neo Nazis. Snow doesn't necessarily do a whole lot of detective work per se; more like he finds some info out and then goes somewhere and starts shooting people. There were a few threads in the book that I felt were not fully explained or dropped too quickly, and there was a lot of violence (it felt like there was a shootout every few pages). That being said, I was really invested in the story and was eager to see where it was going. This book is important in our current xenophobic political climate, and I hope a lot of people read it. I'm definitely interested to see where the next book takes Snow, and I'm planning on reading the first to see what I missed. I don't know if I loved this book because of the accurate picture it gives of Detroit or the plot. Snow is a former police officer who was unfairly fired. He won a 12 million lawsuit against the city. With the money is rehabbing a street in Mexicantown. He spends his money to help others. He is black and Mexican. He grew up in the area he is living in now. When Wayne County Coroner Dr. Bobby Falconi calls him about a Mexican girl dressed as Marie Antoinette found dead after being tortured in the I don't know if I loved this book because of the accurate picture it gives of Detroit or the plot. Snow is a former police officer who was unfairly fired. He won a 12 million lawsuit against the city. With the money is rehabbing a street in Mexicantown. He spends his money to help others. He is black and Mexican. He grew up in the area he is living in now. When Wayne County Coroner Dr. Bobby Falconi calls him about a Mexican girl dressed as Marie Antoinette found dead after being tortured in the Detroit River. He is outraged and determined to find out who she is and what happened to her. As he explores he finds that she had been in picked up by Customs Enforcement (ICE). When another girl is found, also dress up, he is contacted by his old friend in the FBI. This was, for me, a disappointing sequel. The characters could be good, the setting could be interesting. (Actually, to be fair, the setting (Detroit) IS interesting.) But I think most of the character stuff is either sacrificed to or developed through extremely violent action. If you love books with high body counts, this is for you. But I don't and so it's not. Snow (the main character) is perhaps a good man but his propensity to stop off at the gun locker on his way to do just about anything This was, for me, a disappointing sequel. The characters could be good, the setting could be interesting. (Actually, to be fair, the setting (Detroit) IS interesting.) But I think most of the character stuff is either sacrificed to or developed through extremely violent action. If you love books with high body counts, this is for you. But I don't and so it's not. Snow (the main character) is perhaps a good man but his propensity to stop off at the gun locker on his way to do just about anything makes it hard for me to really see that. Also he has it propensity to employ torture. I have to state from the outset that I know the author, so maybe I should recuse myself from writing a review. But this book is so good, I just can't refrain from proffering my two cents. Like his eponymous first book, AUGUST SNOW, this one's a detective novel, also featuring the heroic Mr. Snow, an ex-cop living in Detroit, who gets drawn into a complicated caper. While I'm not gung ho about the political slant of the narrative -- Snow's social activism is a tad too liberal for my taste -- I st I have to state from the outset that I know the author, so maybe I should recuse myself from writing a review. But this book is so good, I just can't refrain from proffering my two cents. I wanted to like this book, because the narrator sounded really interesting, but I ended up abandoning it about halfway through because I just wasn't being pulled into the story. I didn't know when I picked it up that it was a sequel, so maybe if I read the first book, I'd feel differently. I see a lot of reviews that say this book wasn't as strong as the first one, though. I will say that the author clearly knows Detroit very well, and the amount of detail he gives in describing the setting rea I wanted to like this book, because the narrator sounded really interesting, but I ended up abandoning it about halfway through because I just wasn't being pulled into the story. I didn't know when I picked it up that it was a sequel, so maybe if I read the first book, I'd feel differently. I see a lot of reviews that say this book wasn't as strong as the first one, though. I will say that the author clearly knows Detroit very well, and the amount of detail he gives in describing the setting really makes the city come to life. It was a little distracting after a point, though. He'd spend a lot of time giving background about a particular location that could have been used to keep moving the story forward. This is the second book in the series that I have read. This author is so good. The story is so tight, the flow of the action and the characters in the event is spot-on. And at the very end I was surprised and amazed and so clear set this was a righteous in me. I am a character and relationship person. These stories are built on these factors. And I am a Detroit girl. Only left home after college. Have such great memories of that City before the big trouble. This writer brings m Hated this to end! I am a character and relationship person. These stories are built on these factors. And I am a Detroit girl. Only left home after college. Have such great memories of that City before the big trouble. This writer brings me back to Detroit, great things I remember and the sense of its New Life in these days. The mix of crime and neighborhood and government agencies and some of the worst aspects of Michigan come together in a great story. Stephen Mack Jones is a published poet, award-winning playwright, and recipient of the prestigious Kresge Arts in Detroit Literary Fellowship. He survived a number of years in advertising and marketing communications. Mr. Jones was born in Lansing, Michigan, and currently lives in Farmington Hills, outside of Detroit. August Snow is his first novel.